Ironies abound. My work involves trying to prevent big explosions – something I’ve failed miserably at on the cellular level. 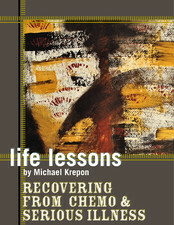 I am a survivor of a stage-four lymphoma and a Gleason nine prostate cancer. (For those not into medical numerology, these are bad numbers.) Long ago, my boss on Capitol Hill succeeded in blocking the US Army from getting into the binary nerve gas business. Now I have joined the ranks of those who have benefitted from a different kind of chemical warfare. “Sympathy is non-binding.” Very good. Couldn’t express it better myself! Last 2 years that I am following Helen Fawkes, I have learned a great deal about life. Giving up is so easy but giving is so very difficult. A great inspiration to all especially those living with cancer.